This is another LP that my friend (read below) gave to me out of guilt. I'm not sure I've even played this one all they way through. In fact, I'd doubt it, because it's pretty damn long. Listening to it now, it does sound a bit familiar, but only "Nothin' But Love" stands out, and I think that's because it was the b-side to the "I Get Around" cassette single I had in high school. 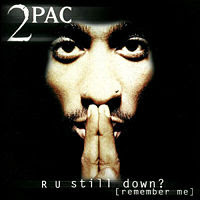 This was 2Pac's first official posthumous release, and considering the length, I remember being surprised that they were using up so much material on the first shot. Little did I know. Most of the tracks here are from his semi-early career, and they hold up pretty well, aside from the requisite thug ballad, which this time around is "I Wonder If Heaven Got A Ghetto." Gimme a break. I've learned to like some 2Pac over the years, but I've never been able to take the plunge and really get into it. The more people praise him and insist on placing him on that shaky pedestal, the more I want to run the other direction. But, you can't deny the man's work ethic. "Nothin But Love (Original Version)"